The Ironclaw RGB is one of three new mice that Corsair is debuting at CES 2019. The other two are the latest iteration of its popular M65, the M65 RGB Elite, and a new wireless mouse, the Harpoon Wireless RGB, which I’ll be reviewing shortly too. Contrary to the opening subject of this paragraph, the picture below is not of the Ironclaw RGB. It is in fact a Corsair-supplied image of the MM350 Extended XL mouse pad, which is relevant to this paragraph because it too is a newly launched product as of CES 2019. Costing £35, the pad measures 930mm wide and 400mm deep and sports a textile-weave top and anti-slip rubber bottom. The Ironclaw RGB, meanwhile, is not mouse pad; it is a mouse! A wired mouse, to be more precise, sporting as it does a braided 1.8m USB cable, which sadly is not detachable. As is standard for gaming mice, the USB polling rate is 1,000Hz – I wouldn't expect anything less. As I’m used to seeing M65 variants from Corsair, the larger size of the Ironclaw RGB immediately struck me. 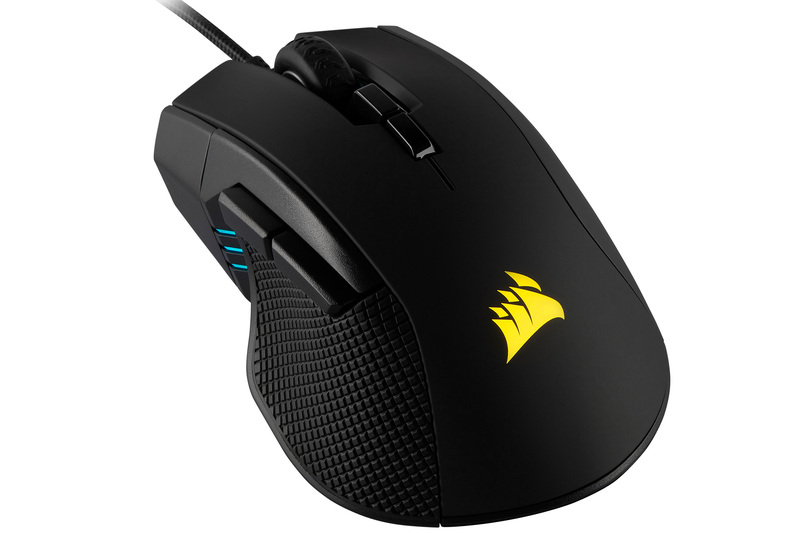 Indeed, Corsair says it has been specifically designed for users with longer hands and/or those who prefer using a palm grip. I fall distinctly into that latter category for the most part, so I wasn’t surprised to find myself quickly enjoying the ergonomics on offer here. The contours feel very natural, and the contrast of soft-touch on top and textured rubber on the sides is another bonus in terms of balancing grip and comfort. There isn’t proper ring and pinky support, but I had no issues keeping them gripped to the right side and not dragging along my mat. A weight of 105g puts the Ironclaw RGB on the heavier side of the scale compared to many more nimble and smaller rodents, but that’s to be expected. Relative to similarly sized mice it isn’t too bloated here, and the four large PTFE feet mean it glides smoothly in use. The seven-button design is largely standard at this point, with two DPI toggles beneath the scroll wheel making up the final total in addition to the main buttons and the thumb-accessible back/forward switches. The latter two are particularly excellent in terms of size and position, protruding out enough that you can easily use a quick rolling motion to actuate them. The two DPI buttons are as ever a little harder to actuate quickly, but usually you don’t need to toggle these frequently in the heat of battle. The scroll wheel action is pleasant enough, and the textured rubber is again useful here, but being picky I’d say the click action should be a touch lighter and the scroll notches a little more clearly defined – that’s very much a personal preference, though. Corsair is using Omron switches rated to over 50 million clicks beneath the main clickers. I’m told these have a 60g actuation force and 0.45mm actuation distance, and subjectively this translates into the usual crisp precision that I associate with Omron switches. Fast, repeated clicking (e.g. moving in a MOBA or shooting in single-fire mode) is handled very well too. The optical sensor inside is co-developed with PixArt and given the model number PMW3391. There is limited information about this online currently, but it’s likely a modification or repurposing of an existing design, as the specifications are nothing new: It supports DPI levels of between 100 and a staggering 18,000, tweakable in increments of 1 – you can’t ask for more than that (nor should you). It can also track at up to 400 inches per second with acceleration of up to 50G. The Ironclaw RGB supports a trio of onboard hardware profiles as well as numerous software-based profiles. Regardless of which you use, each one has a maximum of three DPI levels to flick between. There’s also a dedicated sniper mode DPI, which makes it a shame not to see a dedicated sniper button to give you a quicker, more accessible way of switching DPI, but in fairness it’s easy enough to change the front thumb button to support this function. What Corsair product would be complete without RGB lighting? To that end, the scroll wheel and logo are configurable as individual RGB zones with all the usual effects available in the iCUE software. Also, in front of where your thumb rests is a triple-level indicator zone used to show the DPI status and profile switches – the colour of these lights is also changeable, but the effect will always be static rather than dynamic.